I have been in this hotel right after the open it, I can see now they start to be a proper 5 stars hotel and this thanks to the ladies at the front desk Valeria, Karolina and another lady which i dont recall the name. I am a platinum member and I using many hotelsaround te world, I would reccomend this one in Odessa, much better than any others including Bristol which i Stayed many times before they opened the Hotel De Paris. Location is very convenient, internet works fine, laundry service good enough, restaurant very good quality, good gym and sauna. Dear Guest, On behalf of Hotel de Paris Odessa MGallery by Sofitel team, we want to thank you for your amazing review about your stay and the hotel overall! We appreciate your recommendation to other Tripadvisor users. 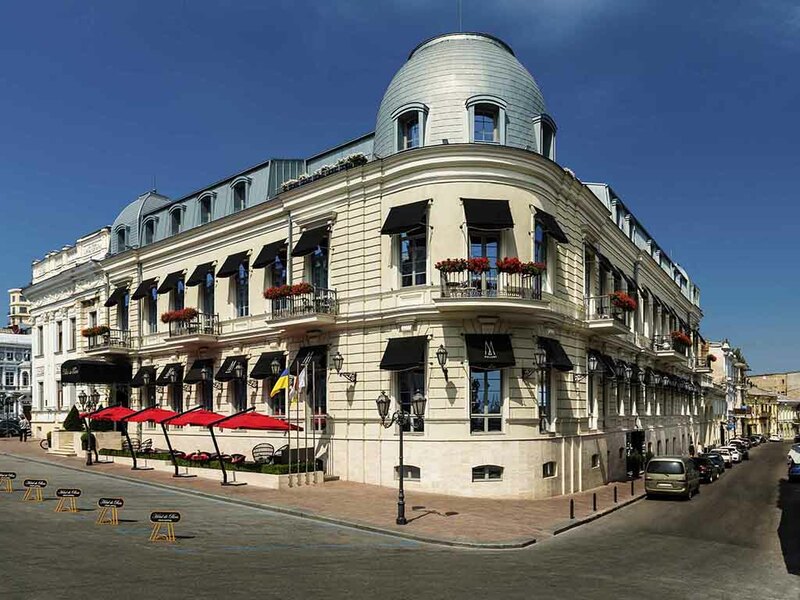 We look forward to welcoming you again soon at Hotel de Paris Odessa MGallery by Sofitel! Top hotel in Odessa, superb interior and great staff. Did not have breakfast so can't assess. I was only bit surprised that I saw two different price lists of SPA but finally I did not use it anyway. .
Dear Guest, Thank you for leaving this review. Our team is very happy you enjoyed your stay at Hotel de Paris Odessa MGallery by Sofitel! Apologies for any inconvenience caused by different price lists. We hope to welcome you back to experience our breakfast and many other facilities at Hotel de Paris Odessa MGallery by Sofitell! I always stay at Hotel de Paris, very nice staff speaking english, helping at all issues. I enjoy the stylish rooms with perfect bathroom and shower. The rooms are quite, clean and nice comfortable beds. The location is the best at torn, cannot be better. Dear Guest, Thank you very much for your amazing feedback! We are pleased you loved interior at Hotel de Paris MGallery by Sofitel, as well as staff professionalism. We are looking forward to welcome you back! I have been in this hotel 4 times already, first time just after the opened. Over the time i saw very good improvements although I can still see some more is needed but overall my stay was very good. The hotel rooms are very modern, the internet wifi works well, breakfast quiet good, restaurant very good as well. Location is ideal, overall i would recommend. Dear Mr. Avagliano, Thank you very much for your feedback! We hope to hear back from you about the improvement, you think should be undertaken to Hotel de Paris MGallery by Sofitel, because every opinion matters to us! Our team hope to welcome you back soon! Hotel is really nice, clean, cosy and friendly. Location is perfec, t if you are interested in city architecture , Doormen Vladimir is real insider and symbol of hotel, thanks a lot for his kind support and creating of nice atmosphere. I was extremely pleased to have stayed in MGallery in Odessa. Started right from the doorman, to front desk staff to Housemaid, they were all very friendly and helpful. My photography tripod got a loose leg, front staff brought it the their mechanics for a quick fix right away, and he brought it back to my room in person -- within 30 mins. Doorman was attentive and always assist mt heavy luggage, housemaid brought extra amenities without any delay. Decoration was real modern classic, spotlessly clean.